Timber post set directly onto concrete. Hi Russell, thank you for your question. Without knowing much about the project I will air on the conservative side, as actual soil bearing pressure and site conditions vary dramatically. I will convert your loads and sizes into US Units for my math, followed by conversions back to metric for your benefit. 250×250 post ~ 10×10 post. From the International Building Code 2015 table 1806.2 – the minimum soil bearing pressure is 1,500 lbs/sqft. With a load of 1875 lbs, that means you only need an area of ~1.23 ft2, which is somewhere between a 12”x12” pad and a 18”x18” pad. I would use the 18”x18” pad, and it is not much load so 4” thick should suffice. I would make sure to set it below the frost line for your area (have the top of the pad be at the frost depth level). You would then cast a pier from the pad up to the required height for the post (12”x12” or a 12” sonotube). 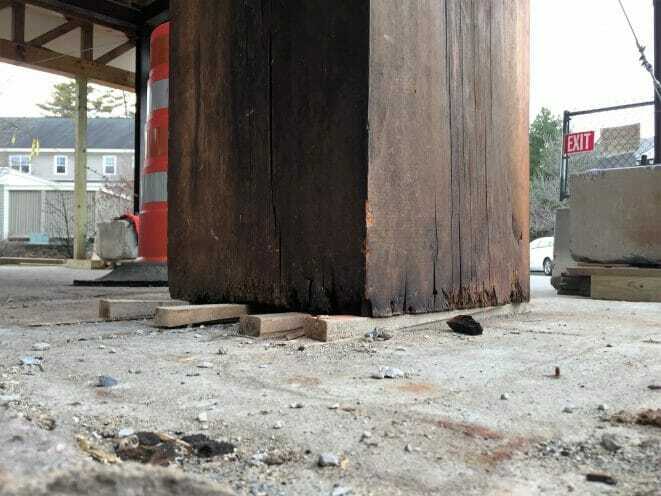 Make sure to have a 1” (min) standoff metal base for the post as well, you do not want the timber post to sit directly on the concrete as the timber can wick moisture up through the concrete and rot the base of the post overtime. So, here is my recommendation, which is a very rough guess with my limited information. I would recommend having a local building inspector or engineer taking a look at your actual site conditions. My last advice is to cast some typical j-bolts into the pad as you are pouring it, which run up into the pier and tie both of them together.